Jello shots just got a whole lot classier! 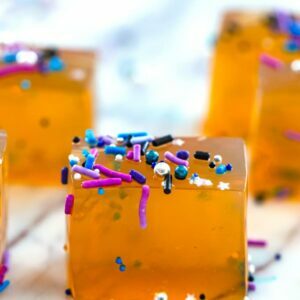 These Butterscotch Jello Shots are a delicious adult jello shot perfect for any party in need of a little extra fun. 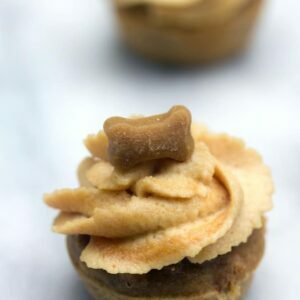 (This recipe for Butterscotch Jello Shots was originally posted in January 2012, but was updated with new photos in 2018). I know. I KNOW. Why is Sues writing a post about jello shots? How old is this girl, anyway? Clearly she can’t let go of her college days. Now we see the truth behind all that Cocktail Friday business. She probably sits on her couch and drinks herself silly every day of the week. But no… I swear it’s not like that. Seriously. I’m just here to keep you up to date on all the latest trends and things that are hip in the food world. And Ladies and Gentleman, jello shots are it. Of course, not the jello shots you remember from your college days. Oh no. These are the more grown up kind. Not the “let’s do jello shots to get drunk” jello shots. But let’s treat jello shots like culinary masterpieces and enjoy them like we would any dessert slash after-dinner drink. At their recent New Year’s Eve party, my sister and Adam ended up having quite a few jello shot delicacies. In addition to my butterscotch jello shots, they made a cosmopolitan jello shot. And even a chocolate peanut butter jello shot. Sounds odd, but was actually amazing tasting. And beautiful at that. 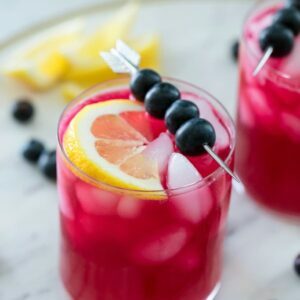 Believe it or not, there is actually a whole book on grown-up jello shots called Jelly Shot Test Kitchen (affiliate link). And I got this recipe inspirations from their blog… a recipe that was actually inspired from Harry Potter. Seriously. They’re were originally Butterbeer Jelly Shots and I’m pretty sure they taste like what you would actually imagine Butterbeer to taste like… If, you know, Harry Potter and gang had the opportunity to have jello shots (believe it or not, this isn’t the only Harry Potter-inspired jello shot the gal from this blog has come up with). I did change up the recipe a bit and have never had butterbeer before, but have come to the conclusion that if you enjoy butterscotch, you will enjoy this jello shot recipe. It’s simple, simple to make these. Seriously, just as simple as making jello shots in those little plastic cups like you did in college. But way classier. 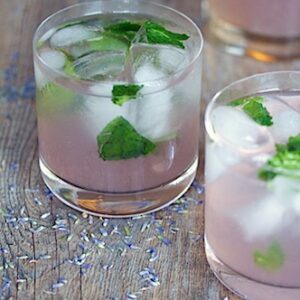 Start by putting the cream soda in a medium-sized saucepan and sprinkling the gelatin over the top. Let it sit for about 2 minutes, to soften. The mixture will look a bit funky! 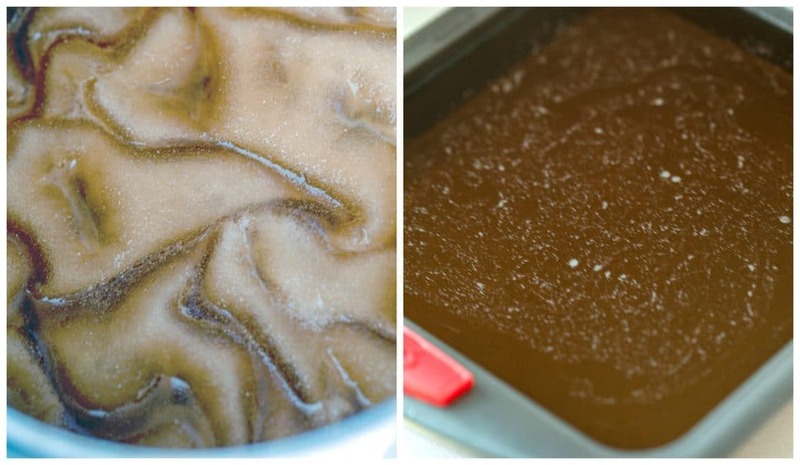 You’ll heat the mixture over low heat, making sure to keep stirring, until all the gelatin is dissolved (4-6 minutes). And it will start to look normal again. And then you can stir in the vanilla vodka and butterscotch schnapps. You can change up the proportions if you like. If you want a bit of a stronger jello shot, add more vanilla vodka. If you prefer sweeter, add more butterscotch schnapps. I’ve made this a couple different ways, both in a 9×5 loaf pan and in a 9×9 square baking pan. The recipe below is for the loaf pan version, but if you prefer to do it in a square pan, I recommend doubling the recipe since you’ll have more surface area to cover. You’ll have to refrigerate the mixture for about 3 hours, until the jello is fully set. And then cut the jello into cubes… Or how ever you want to cut them. 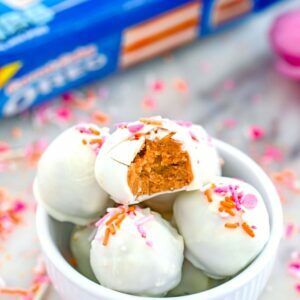 Of course, if you’re serving these at a party (which I kind of hope you are as opposed to simply making them for yourself lol), you’ll want to decorate your butterscotch jello shots. But just know that the sprinkles will dissolve into the jello pretty quickly. So, you should decorate them until right before you’re going to serve them. But for at least a few minutes, they’ll look super fun and New Year-sy and fun. Though depending on what kind of sprinkles you use, you can customize them to whatever holiday you’re serving them at. I should note that sanding sugar is one of the best decorations to use and you want to be careful not to go too crazy on the sprinkles since people aren’t generally carefully chewing jello shots. Though these are so delicious and so different from the jello shots from back in the day where you’d gulp them down hoping not to taste any of the liquor. 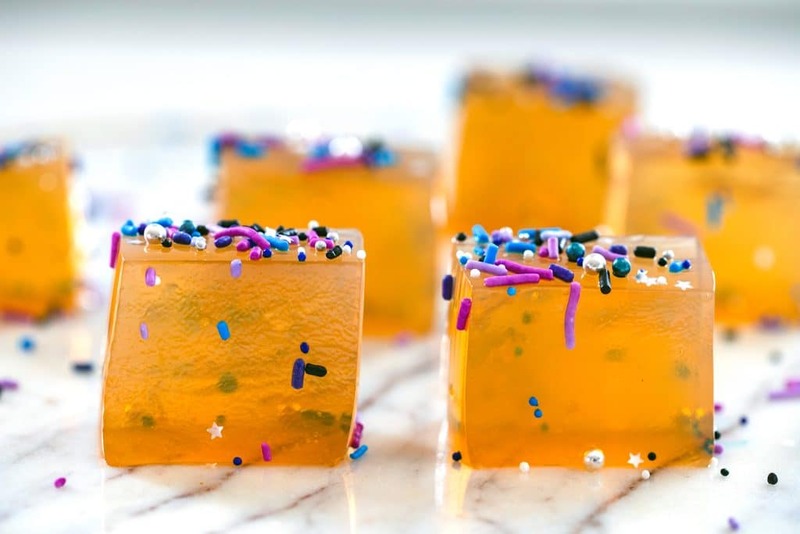 With these butterscotch jello shots, you actually enjoy consuming them like you would any cocktail or dessert that you normally indulge in. How’s that for a Cocktail Friday? Jello shot recipe ideas are seriously endless and I can think of a thousand more I want to make. I’m hoping adult jello shots stay in style for a long time! Would you try making an adult version of jello shots? Or will they always just be too college for you? If you’re looking for more celebratory food, perfect for New Year’s Eve and other events, check out these Dark Chocolate-Dipped Figs with Gorgonzola and these Cheddar Cups with Avocado Feta Mousse. Put cream soda in a medium-sized saucepan and sprinkle gelatin over the top. Let it sit for about 2 minutes, to soften. Heat mixture over low heat, making sure to keep stirring, until all the gelatin is dissolved (4-6 minutes). Remove from heat and stir in vanilla vodka and butterscotch schnapps, altering the proportions if you'd like (if you want a bit of a stronger jello shot, add more vanilla vodka. If you prefer sweeter, add more butterscotch schnapps). Pour the mixture into a heat-resistant 9x5 loaf pan (preferably with straight edges) and refrigerate for about 3 hours, until the jello is fully set. Cut the jello into cubes and keep in refrigerator until ready to serve. If planning to decorate with sprinkles, add to jello shots immediately before serving. If you want to make the jello shots in a square 9x9 pan, I recommend doubling the ingredients in order to fill the surface area. 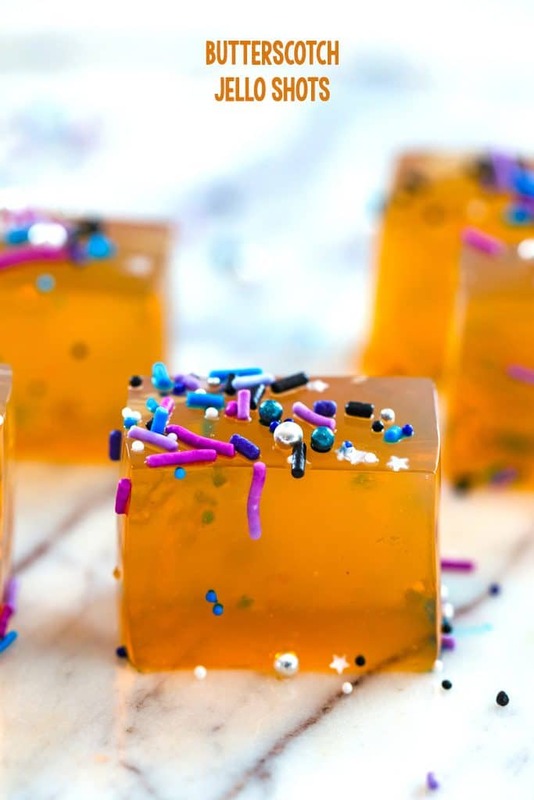 15 Responses to "Butterscotch Jello Shots"
Those jello shots are beautiful! I love the idea of letting them set up in a square pan for square-shaped shots — lovely. so funny – i just found this whole blog about jello! Well, just based on appearance alone, these look a thousand times better than the Jell-O shots we used to have in college. Ha ha. I love how you fancied them up with sparkles. I love jello shots because I can’t let go of my glory days, but I’d totally experiment with the adult kind too! I can burn water, but these butterscotch shots (done in the traditional cups turned out perfect! I would def try these jello shots. I try not to put an age limit on things that I love. Yes, I am an adult but I still like cartoons on Saturday mornings with my bowl of fav cereal, on occasion I will color (with little nephew). as long as my adult responsibilities are taken care of….I don’t see a problem with indulging things from your youth…..Why Not? Envision: clear, shiny, caramel-y gel with layer of reese’s cups visible through it (like flowers in ice cubes)….and chocolate cake sides, with pb whipped filling and goodies inside….. I have actually never tried a jello shot, but you just sold me! I am totally making these for our New Year’s party!